(,Events or Special Place and more. When you leave the leave engraving details, you can add emoji: heart, crown, cross, arrow. Engraving Details. Material: 925 Solid Sterling Silver. 3) Necklace Color. Material : 14K Gold Plated / Solid Sterling Silver 925. (Red, Blue,Yellow ,Green ,White ,Clear ,Black ,Pink ). ALL STYLES AVAILABLE IN ALL STERLING SILVER UPON REQUEST. CHOOSE A BACK GROUND COLOR FROM SECOND PICTURE OR LIST BELOW. A dazzling white-gold plated pendant necklace with clear Austrian rhinestones and a colour-changing water-drop shaped purple crystal. Pendant size is 34mm by 12mm. Comes in a black jewellery box. The pendant is handmade, adding to its personalized feel, and is eye-catching when worn. Show your love with PersJewel. Note - The pendant and chain are made of 14k solid white gold. Material: 14k Solid White Gold. Made of 14k solid white gold, this high-quality necklace is bang on trend! 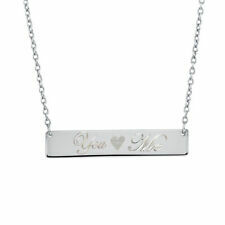 Engraved with an initial of your choice, this celebrity necklace teams beautifully with both smart and casual wear. The disc is handmade, adding to its personalized feel, and is eye-catching when worn. Show love to that special one, by gifting them this Swarovski Necklace. Swarovski Crystal. Necklace.925 Stamp. Hypoallergenic Jewelry. Material: Sterling Silver Plated. Sterling Silver Plated. Inside. and out. The love heart necklace is a good choice for you,which is a good gift for family friend lover. Best not to wear when taking a bath or swim ?. Regularly wipe the surface with polishing cloth. ♥Heart Pendant♥: Heart Love Pendant Size: 28 17.2 MM, 1.2 mm thickness Singapore Chain 18". Personalized charming. 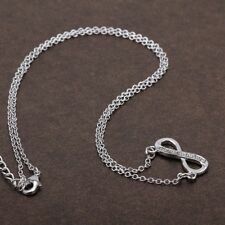 The chain of the necklace is adjustable. Gem Type: NA. The product is made of brass and plated gold or silver, will not deform easily. 100% safe to sensitive skin. About LuckySuen Jewelry. It is your perfect choice. The necklace is sold by LuckySuen and Fulfilled by Amazon. Responsible for any quality issue. LuckySuen would always here for you whenever you need. Material Purity : 10K. ABOUT ICE CARATS. Product Type : Jewelry. ✅ Connect with Jewelry Experts. Each piece hand stamped for authenticity. Jewelry Type : Pendants & Charms. Material : Gold. Finish : Polished & Laser Design. ♥Heart Pendant♥: Heart Love Pendant Size: 28 17.2 MM, 1.2 mm thickness Singapore Chain 18". ♥Material♥:18k White Gold Plated Sterling Silver, Nickle Free. We stand behind our products. Best Price.